JW's Financial Coaching Podcast Lesson #97-How to ride the stock market roller coaster | JW's Financial Coaching-Giving you a new perspective on your money! Is your 401(K) or IRA balance down? Can a short term down market actually be a good long term thing? The chart above is the performance of the Dow Jones Index for the past 6 months. 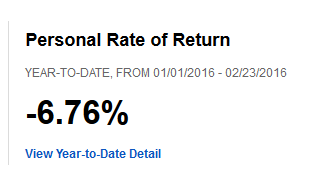 After a nice buildup in the last part of 2015, we’ve definitely hit a dip to start off 2016. So it’s not just you who have experienced a dip. It’s ALL of us, including myself. With that being said, don’t panic, don’t sell off your investments, and don’t stop contributing to your retirement accounts. Turn off the TV, stop reading Yahoo Finance, and don’t check your balance every day. Below are a few things to remember while riding down the stock market roller coaster. You are in it for the long run-One of the main things to remember when there is a downturn in the market is that if you aren’t retired, it doesn’t really matter what your balance is; there is time to recover. Even if you are retired or close to retirement today you aren’t going to use all your money today anyways. Yes it might hurt to look at your statement today, but the truth is that it only matters how much money is in your retirement when you go to use it. Buying shares at lower prices-When a computer, TV, car, phone, or other consumer goods go down in price do we get worried and not buy that item? No, instead we usually go out and buy more of that product because it is on sale. Why then don’t we do the same thing with the stock market? Looking at it another way, when the stock market dips down, that means we get to buy more shares of a stock or mutual fund then we would have normally with our monthly contribution. Then when the stock market roller coaster goes up we’ll have an even greater gain. Diversification-When we have all of our eggs in one basket a downturn in the market is really scary. If we own single stocks or a large amount of our 401(K) is in our company’s stock, downturns are going to hit us a lot harder. That just highlights the importance of diversification. Investing in several different types of funds amongst many different categories might not be the most exciting thing during a stock market increase, but it makes the dips a lot easier to manage. The roller coaster climbs and dips are all relative-Earlier I showed you a picture of the Dow Jones Index over the past six months. Now below is one from the past 10 years: As you can see, even after our dip, we’re still about where we were at the beginning of 2014 and a lot higher than we were in 2006, and have more than recovered the losses from the Great Recession of 2008-2009. So it’s all relative. Like a roller coaster, the stock market has its ups and downs but over history it has always continued to climb higher despite downturns. This entry was posted in Investing, Podcast, Uncategorized and tagged Personal Finance, Podcast. Bookmark the permalink.